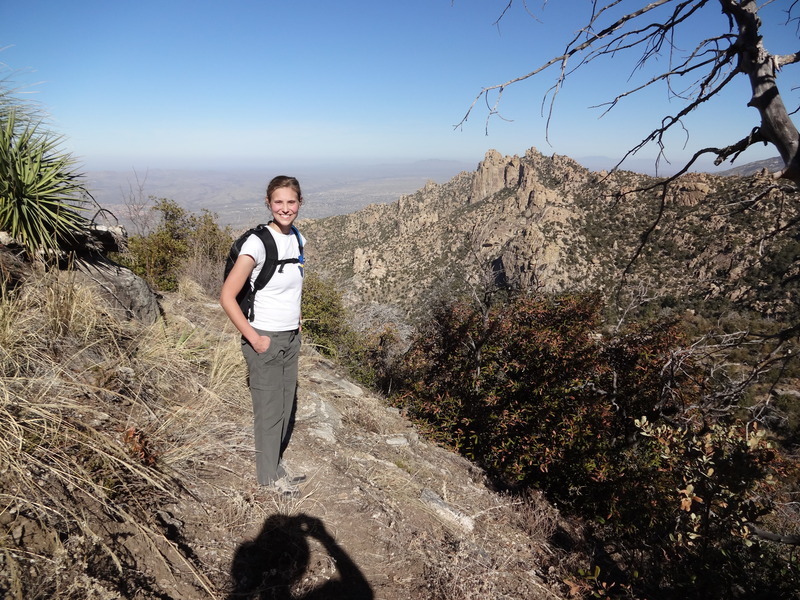 Mount Lemmon has (okay, the Santa Catalina Mountains have) several wonderful long loop hikes – although some of them are perhaps better described as semi-loops as they start and end in different places. The semi-loops can obviously be done with a car shuttle, or if you have several people in your party, some can do it in opposite directions and swap car keys when they meet. 17.3 miles. This is a pure loop since you start and finish at the Sabino Canyon parking area. It’s a great hike, and a bit like a sandwich – crowds at both ends with solitude in the middle. Do the popular walk (3.8 miles) to Seven Falls. Just before Seven Falls the trail heads up to the right, the crowds disappear, and you pretty much have the trail to yourself. After about 2.1 miles you climb the switchbacks to a flattish area, where there are vague trails leading left. Ignore them as the main trail continues northwards. Soon you are at the crest, where one trail heads down into the valley and another leads leftwards. When we did it the leftward trail was unmarked, but is in fact the shorter way. Either go left or go down into the valley then go left. A major trail will lead you along some major downhill switchbacks until a signed trail leads left to Sabino Canyon. Follow the Phone Line trail down (or the road if you prefer). 15.4 miles. A semi-loop, where you’ll need a car shuttle or you could leave a bicycle at one trailhead. Follow the Sabino Canyon road for about 1/2 a mile to where a sign points to the the Esperero Trail (#25). Head off to the left and follow the Esperero trail for 2.9 miles to Cardiac Gap (a good hike in itself), then continue for another 3.4 miles past Geronimo Meadow to the turnoff to the Cathedral Rock trail. Continue along the main trail for 2 miles, eventually wandering up and left and around, then descending to The Window. Another 1.2 miles and a trail turns off to the left down Ventana Canyon. 12.5 miles. Another semi-loop where you’ll need a car shuttle. Hike 4.6 miles up the Finger Rock trail, which has some wonderful steep sections up slabs of rock, until you reach an intersection where you turn left towards Mount Kimball. In half a mile there is a trail leading uphill to the right to the summit of Mount Kimball. It’s a short hike to the summit. The best views are a little past the summit. Come back down and continue west for 1.5 miles to where the trail heads down Pima Canyon. Follow this down for 5.7 miles to the trailhead. Because Esperero and Ventana Canyons head a bit westward, and Finger Rock and Pima Canyons head a bit eastward, you can easily combine them in different ways. 23.7 miles. Another pure loop, this is the hike I call the Mount Lemmon Grand Loop. 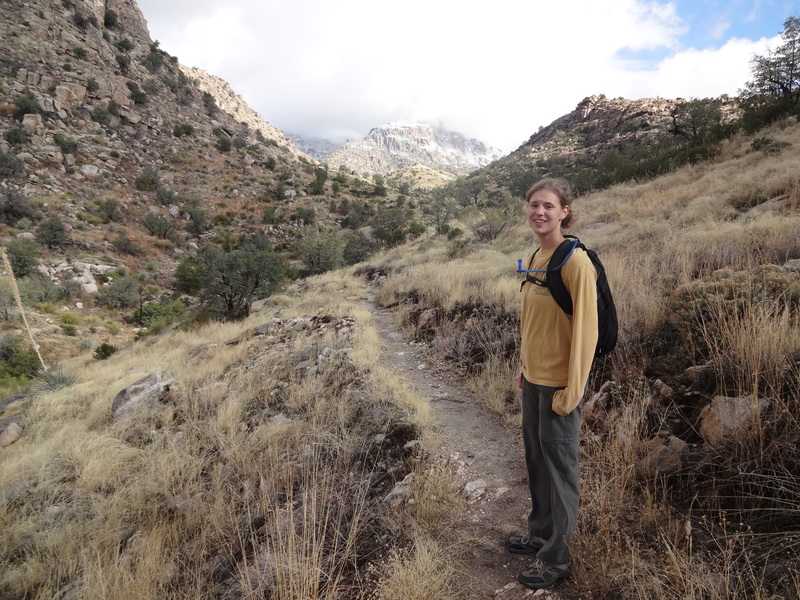 It’s big, bad, and beautiful, and is my favorite hike in the Santa Catalina Mountains. 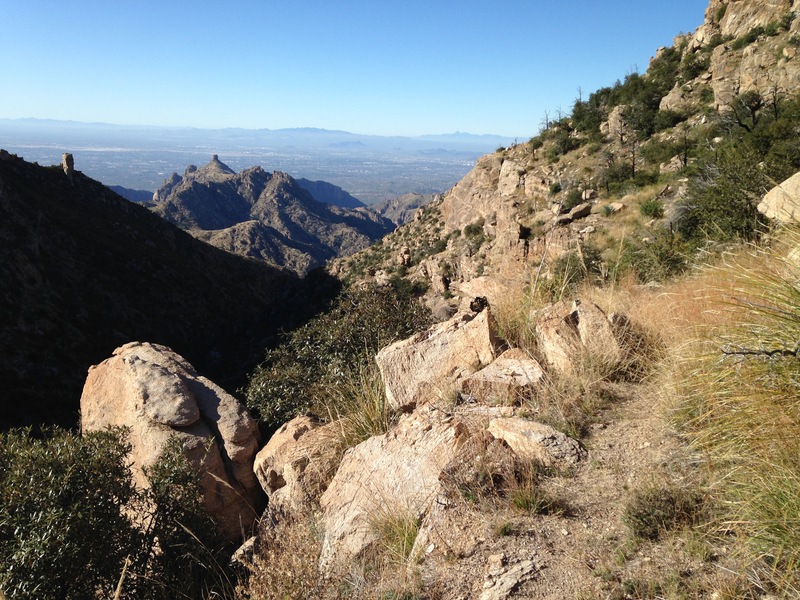 Starting and finishing at Catalina State Park, it is a big loop with a short side excursion to the top of Mount Lemmon. Expect to take a full day on it. Start up the Sutherland Trail, which for the first few miles follows a dirt road, and is a rather ugly hike. Eventually it becomes a pure trail and as you continue upwards you realize not many people come this way. When you finally reach the ridge, the trail becomes very faint but if you pay attention you can find and follow cairns leading off to the left. Fortunately you can’t go seriously wrong and after a while the trail becomes more obvious and then merges with the Samaniego Trail coming in from the left. 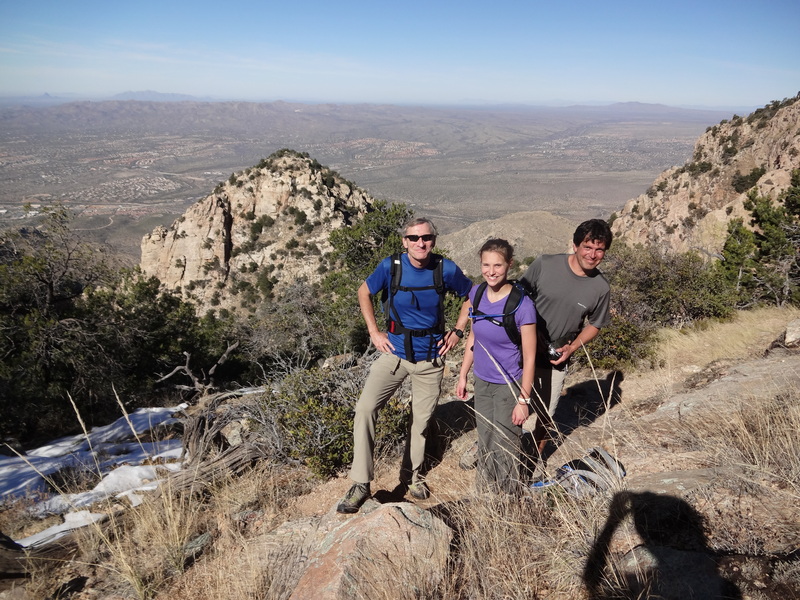 Another 0.8 miles and you join the Mount Lemmon Trail (trail #5). 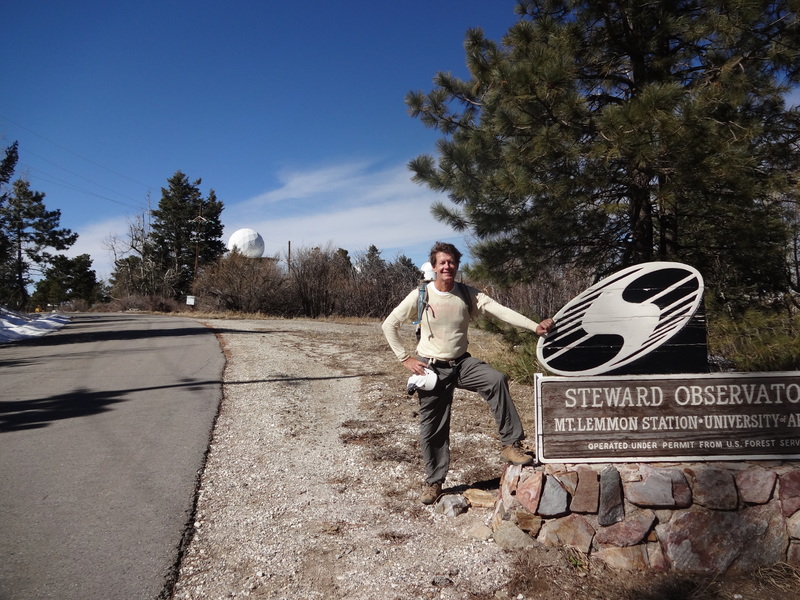 Turn left and follow this for 1.5 miles to the top of Mount Lemmon and an obligatory photograph. About 10.6 miles from the trailhead. 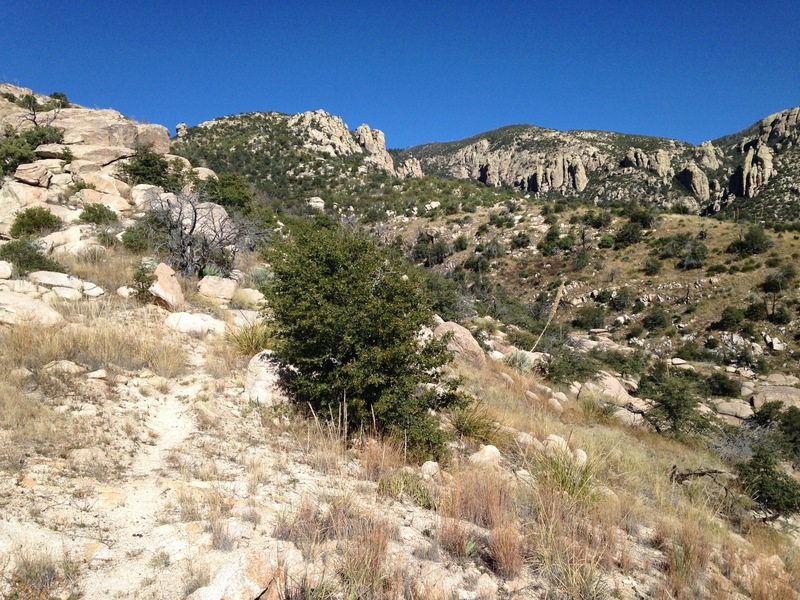 Head back down the Mount Lemmon Trail for about 6 miles, passing beautiful outcrops and spectacular scenery, until finally you reach Romero Pass. Turn right here and go down lovely Romero Canyon for 7.2 miles until you reach your car, tired, and hopefully satisfied 🙂 About 13.1 miles from the top. 24.8 miles. Another long but enjoyable and scenic hike. This is a pure loop, starting and finishing at the Sabino Canyon parking lot. Expect to take a full day. There are a few places where the trail can be difficult to see, but there are always cairns to follow. Hike up Bear Canyon towards Seven Falls. Just before Seven Falls the trail heads up to the right. Follow this up and over the saddle for about 4 miles. 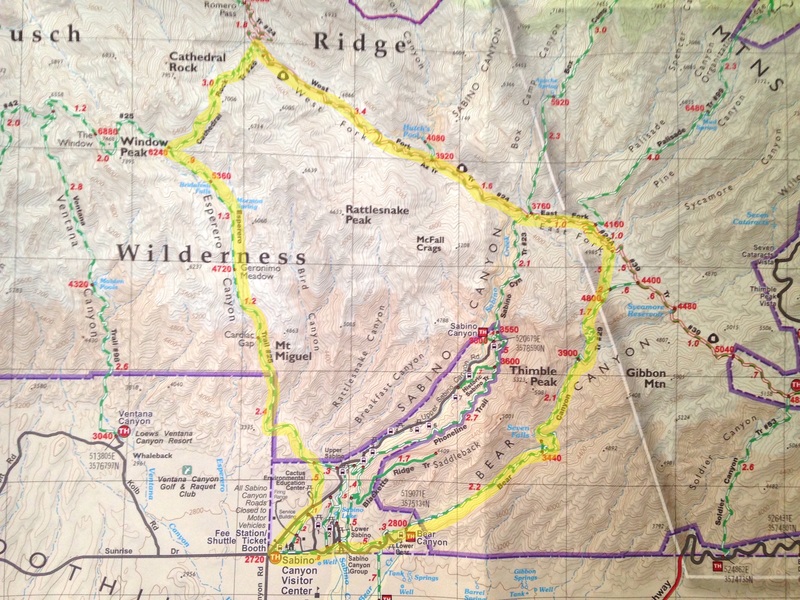 As you head down into the East Fork valley, the trail splits. Take the left fork and continue along this until it joins the East Fork Trail. Keep heading west for about 2 miles to the turnoff to Sabino Canyon. Continue up the West Fork Trail for 5 miles to a signpost for the Cathedral Rock Trail. Follow the Cathedral Rock Trail, bearing slightly left to start. The trail from here to the saddle below Cathedral Rock is the steepest and hardest part of the hike. From the saddle you can look up at the rocks protecting the Inner Sanctum of Cathedral Rock – the way in through a keyhole shaped hole on the left side. However, you won’t be heading up there on this hike. Instead, head down the other side until you join the Esperero Trail. Turn left and follow the trail for 3.4 miles to Cardiac Gap (you’ll go past Bridalveil Falls after about 1 mile), then continue another 2.9 miles until you reach the Sabino Canyon road. Turn right and reach the parking lot in about 0.5 miles. About 17 miles. A great hike with spectacular views, this goes down the Palisades Trail and up the Box Camp Trail. 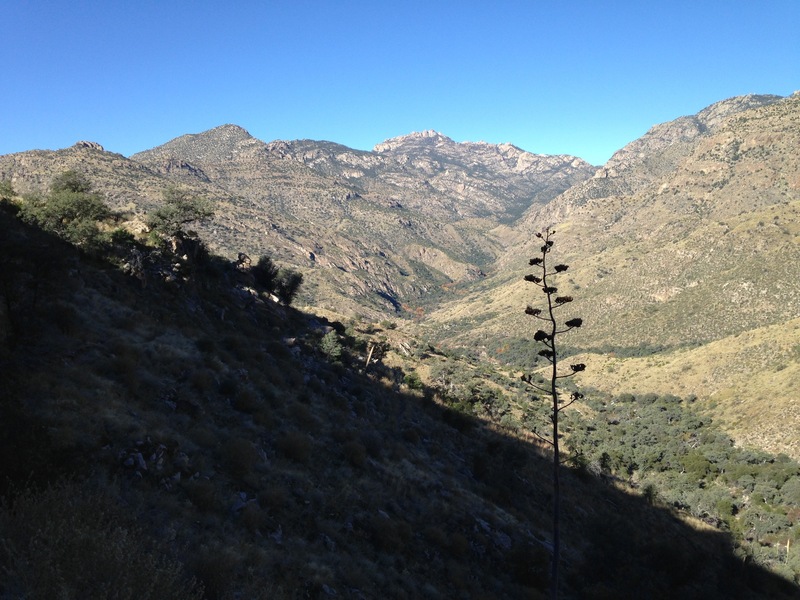 Drive up the Catalina Highway to the Box Camp trailhead, about 2 miles after the Palisades Visitor Center. From the Box Camp trailhead, walk back down the Catalina Highway to the Palisades Visitor Center then head south down towards Camp Lawton. Turn right onto Organization Ridge Road and follow this for a few hundred yards to the Palisades Trail parking area. The trail starts just to the right of the parking area. Follow the trail downhill for about 7.1 miles to the East Fork trail. The views of Thimble Peak get progressively better as you descend. At one point the trail goes into the rocky riverbed – just make sure you follow the cairns. The trail then leaves the riverbed and follows a spectacular shelf on the right side of the canyon. (There was a wire across the shelf at one point at with a piece of colored foil attached to grab your attention – so be careful.) After the shelf ends, you head right then zig-zag down into the valley below. This part of the trail is rougher and more overgrown than the upper section. Head uphill and follow the trail for about 2.3 miles over grassy terrain and up a small canyon. This part of the trail can be overgrown and difficult to follow, so make sure you keep your eyes on the cairns. Just before a cliff the trail heads right and out of the canyon, and past a spring. Once past the spring, the terrain changes and the trail is easier to follow. Continue for another 4.8 miles, with the trail becoming generally easier angled as you get higher. The last section has lovely views of Mt Lemmon and Summerhaven.